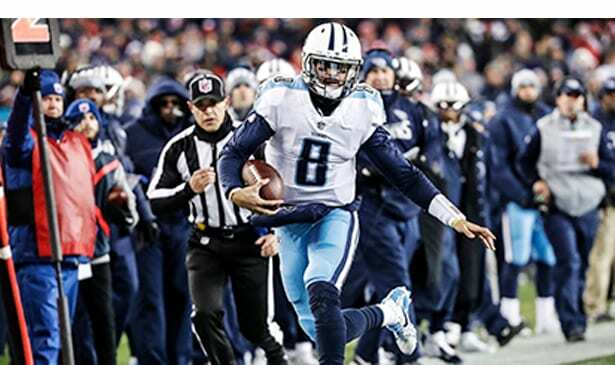 The Titans season ended Saturday night with a 35-14 loss to the Patriots. The Tennessee Titans knew it would take a flawless effort to upset the New England Patriots at home Saturday night, and they came up with something far less than that, getting blasted 35-14 by the Patriots in an AFC divisional playoff game. The win put Patriots into their seventh straight AFC championship game. The loss ended the Titans season at 10-8, and it was a symbol of just how wide a gap exists between the Patriots and an emerging team like the Titans. After scoring an early touchdown on an impressive 95-yard march, the Titans didn’t score again until the final moments of the game. The Patriots not only scored 35 straight points, but did pretty much everything that they wanted while also stopping cold the Titans’ offensive strategy. The Titans had rallied last week from an 18-point deficit against the Kansas City Chiefs through establishing a bruising running game in the second half keyed by Derrick Henry. But against New England Henry never got started. He gained only 28 yards on 12 carries, with the Patriots shutting off the outside and plugging up the inside. They also put a man exclusively on QB Marcus Mariota after the Titans’ first score, effectively eliminating the threat of him beating them with runs and extending third quarter drives. Once the Titans got way behind, the Patriots pass rush blew threw a Titans’ offensive line missing a big piece in right tackle Jake Conklin. He went to the locker room late in the first quarter injured and didn’t return. Several of the eight Patriots sacks on Mariota came through on what would have been Conklin’s side of the line. Meanwhile, Tom Brady was having a field day, completing 35 of 53 passes for 337 yards and three touchdowns. He broke an NFL playoff record he previously shared with Joe Montana, as this was his 10th postseason game with three or more touchdown passes. Brady wasn’t sacked once, and Danny Amendola led Patriots receivers with 11 receptions for 112 yards. Dion Lewis added 62 rushing and 79 receiving. Mariota did managed to complete 22 of 37 passes for 254 yards and touchdowns, but spent much of the second half getting up after being sacked. The Titans did get a fine game from rookie receiver Corey Davis. He caught two touchdown passes, the first of which was a near one-hand grab in the end zone of a perfectly thrown pass. The other came after the game had long been decided, but his performance in the playoffs gives the Titans much hope he’ll materialize into the big play receiver they’ve long lacked. The Titans were also on the wrong end of two more awful calls. One, an offensive pass inference against Eric Decker when the score was tied 7-7 killed what might have been a promising drive. The second was a highly questionable special teams call on fourth down, which ended with the Titans rather than the Patriots being penalized and the Patriots retaining possession on the drive that eventually made it 21-7. Of course no one thinks those calls made the difference. The Patriots were and are the superior team. The Titans are an improving squad, but they’ve got a long way to go before they can beat a team like the Patriots in the playoffs. Now we’ll see what changes and improvements come in the offseason.